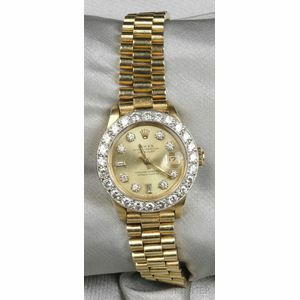 18kt Gold and Diamond Wristwatch, Rolex, "Oyster Perpetual Datejust," the gold metal dial with diamond numeral indicators and date aperture, the bezel set with full-cut diamond melee, approx. total wt. 1.20 cts., completed by a President's bracelet with deployant clasp, no. 6917, 7206434, interior cir. 7 in. Wear with use, surface scratches to crystal, bracelet is stretched, watch is currently setting and running, missing second hand.